This article is about the manufacturing process. For other uses, see Casting (disambiguation). For molding plastics, see Molding (process). Judenplatz Holocaust Memorial (Nameless Library), by Rachel Whiteread. Concrete cast of books on library shelves turned inside out. Casting is a 6000-year-old process. The oldest surviving casting is a copper frog from 3200 BC. 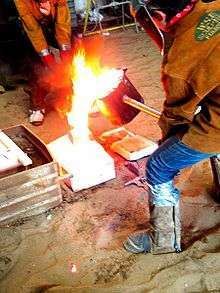 In metalworking, metal is heated until it becomes liquid and is then poured into a mold. The mold is a hollow cavity that includes the desired shape, but the mold also includes runners and risers that enable the metal to fill the mold. The mold and the metal are then cooled until the metal solidifies. The solidified part (the casting) is then recovered from the mold. 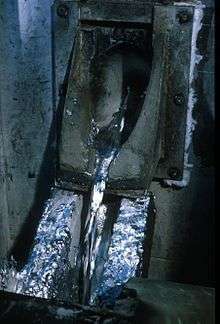 Subsequent operations remove excess material caused by the casting process (such as the runners and risers). Plaster and other chemical curing materials such as concrete and plastic resin may be cast using single-use waste molds as noted above, multiple-use 'piece' molds, or molds made of small rigid pieces or of flexible material such as latex rubber (which is in turn supported by an exterior mold). When casting plaster or concrete, the material surface is flat and lacks transparency. Often topical treatments are applied to the surface. For example, painting and etching can be used in a way that give the appearance of metal or stone. Alternatively, the material is altered in its initial casting process and may contain colored sand so as to give an appearance of stone. By casting concrete, rather than plaster, it is possible to create sculptures, fountains, or seating for outdoor use. A simulation of high-quality marble may be made using certain chemically-set plastic resins (for example epoxy or polyester) with powdered stone added for coloration, often with multiple colors worked in. The latter is a common means of making washstands, washstand tops and shower stalls, with the skilled working of multiple colors resulting in simulated staining patterns as is often found in natural marble or travertine. Raw castings often contain irregularities caused by seams and imperfections in the molds, as well as access ports for pouring material into the molds. The process of cutting, grinding, shaving or sanding away these unwanted bits is called "fettling". In modern times robotic processes have been developed to perform some of the more repetitive parts of the fettling process, but historically fettlers carried out this arduous work manually, and often in conditions dangerous to their health. Fettling can add significantly to the cost of the resulting product, and designers of molds seek to minimize it through the shape of the mold, the material being cast, and sometimes by including decorative elements. Casting process simulation uses numerical methods to calculate cast component quality considering mold filling, solidification and cooling, and provides a quantitative prediction of casting mechanical properties, thermal stresses and distortion. Simulation accurately describes a cast component’s quality up-front before production starts. The casting rigging can be designed with respect to the required component properties. This has benefits beyond a reduction in pre-production sampling, as the precise layout of the complete casting system also leads to energy, material, and tooling savings. The software supports the user in component design, the determination of melting practice and casting methoding through to pattern and mold making, heat treatment, and finishing. This saves costs along the entire casting manufacturing route. Casting process simulation was initially developed at universities starting from the early '70s, mainly in Europe and in the U.S., and is regarded as the most important innovation in casting technology over the last 50 years. Since the late '80s, commercial programs (such as AutoCAST and MAGMA) are available which make it possible for foundries to gain new insight into what is happening inside the mold or die during the casting process. 1 2 Gordon Elliott (2006). Aspects of Ceramic History: A Series of Papers Focusing on the Ceramic Artifact As Evidence of Cultural and Technical Development. Gordon Elliott. pp. 52–. ISBN 978-0-9557690-0-9. ↑ B. Ravi (1 January 2005). Metal Casting: Computer-Aided Design and Analysis. PHI Learning Pvt. Ltd. pp. 92–. ISBN 978-81-203-2726-9. ↑ T F Waters (11 September 2002). Fundamentals of Manufacturing For Engineers. CRC Press. pp. 17–. ISBN 978-0-203-50018-7. ↑ James T. Frane (1994). Craftsman's Illustrated Dictionary of Construction Terms. Craftsman Book Company. pp. 126–. ISBN 978-1-57218-008-6. ↑ The British Foundryman. 1986. p. 80. ↑ Jane L. Bassett; Peggy Fogelman; David A. Scott; Ronald C. Schmidtling (2008). The Craftsman Revealed: Adriaen de Vries, Sculptor in Bronze. Getty Publications. pp. 269–. ISBN 978-0-89236-919-5. ↑ Sidney Pollard (1993). A History of Labour in Sheffield. Gregg Revivals. pp. 284–285. ISBN 978-0-7512-0215-1. ↑ Iron and Steel. Louis Cassier. 1971. p. 80. Wikimedia Commons has media related to Casting. Campbell, John (2003), Casting (2nd ed. ), Butterworth-Heinemann, ISBN 0-7506-4790-6 .